Start off your visit on the 24th (Tue): get your game on at G2 Ice Karting Levi, explore and take pictures at Ice Karting Levi, then explore and take pictures at Ounaskievari Reindeer Farm, and finally have some family-friendly fun at Kid's Land. To find more things to do, where to stay, reviews, and more tourist information, you can read our Levi trip planner . Bengaluru, India to Levi is an approximately 23-hour flight. Due to the time zone difference, you'll gain 3 hours traveling from Bengaluru to Levi. Traveling from Bengaluru in December, things will get colder in Levi: highs are around -6°C and lows about -15°C. Cap off your sightseeing on the 24th (Tue) early enough to go by car to Rovaniemi. Start off your visit on the 25th (Wed): get in on the family fun at SantaPark - the Home Cavern of Santa Claus, see Santa Claus Office, and then find something for the whole family at Santa Claus Village. You can drive from Levi to Rovaniemi in 2.5 hours. Another option is to take a bus. 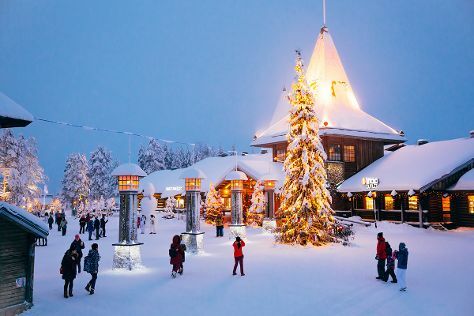 In December in Rovaniemi, expect temperatures between -6°C during the day and -13°C at night. Wrap up your sightseeing on the 25th (Wed) early enough to travel back home.